At Gateway FS Construction Services, we pride ourselves on providing our customers the very best in grain storage systems. Our partner, Sukup Manufacturing has been a leader in manufacturing grain bins, grain dryers and other grain production products for more than 50 years. A family owned business located in Sheffield, Iowa, Sukup is the world’s fastest growing grain bin manufacturing company. If you are considering purchasing a grain storage bin, now is the time to purchase it and Sukup has a special offer for you. Check it out: For a limited time only, Sukup has great discounts on their grain bins and grain dryers. In addition, you can also get a personalized sign added to your new Sukup bin for a discounted price, allowing you to proudly display your farm name for all to see. Don’t delay! Now is definitely the time to purchase that new grain bin you’ve been putting off. Crop forecasts are good, meaning long lines at the elevators are likely this year. Steel prices are low and with Farm Service Agency loans still available, Sukup grain bins are as affordable as they are going to get. Besides getting a good deal on the best grain bins available, the purchase of a new Sukup grain bin is an excellent long-term investment and cost efficient consideration. Most analysts agree that on-farm storage is the most profitable decision for most farmers, allowing them to maintain grain quality after harvest and thus more easily capture any market premiums. A Sukup grain bin will ensure a more efficient and profitable harvest for years to come. 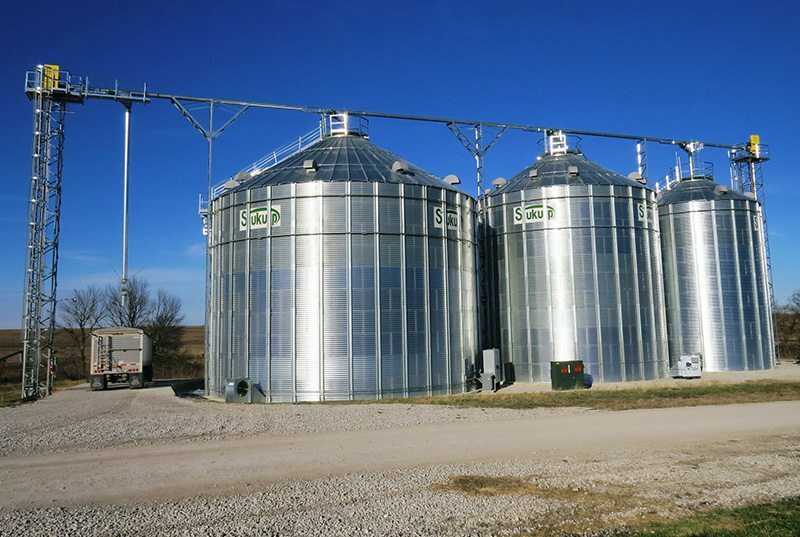 Whatever your grain storage needs, you can depend on Gateway FS Construction Services and our partner Sukup to provide you the system that you need most, when you need it. Give us a call at 866-551-3454 and let our specialists help you choose a grain storage system to meet your specific needs. We look forward to providing you the best customer service experience. Most of us have building foundations made of poured concrete or cement blocks, including customers of Gateway FS Construction Services. Or maybe you have a retaining wall on your property constructed of cement blocks or concrete. Either way, you have a tough job keeping these masonry products properly painted and maintained. The painting specialists at Gateway FS Construction Services are willing to help with any painting project you may have, including masonry. Masonry can be especially tricky to paint and maintain. Masonry products easily allow moisture to pierce deeply into their cores if not properly coated with paint. Also, foundations or retaining walls are constantly exposed to the elements of weather, making them even more susceptible to moisture penetration. The expert painting department at Gateway FS Construction services has some advice below on the proper painting of masonry. All concrete, whether poured or in blocks, has impurities that will rise to the surface if not painted when completely dry. So before beginning your masonry painting project, be sure that any concrete or cement blocks have cured at least 60 days, preferably 90 days. The cement should certainly be completely dry after 90 days. Furthermore, pay attention to the weather before starting to paint to ensure that the temperature is at least 70 degrees with 50% humidity. This combination of temperature and humidity will make sure the coating will penetrate the masonry correctly and cure properly. Finally, do not paint masonry in direct sunlight. Doing so will cause it to dry too quickly and not adhere adequately to the surface. Following these tips or contacting our expert masonry painters at Gateway FS Construction Services can help guide your masonry painting project toward success. Properly applied paint serves as a prevention to many potential masonry issues, including water damage, mold or mildew growth and peeling of the paint. Whatever your painting needs, the professional painting team at Gateway FS Construction Services can help. Give us a call at 866-551-3454 today and talk to one of our experienced painting representatives. We look forward to providing you the best customer service experience. Post-frame buildings are an integral part of any building complex, as any Gateway FS Construction Services customer knows. However, since most people do not have the resources to design and construct a quality-engineered post frame building, they have to depend on a contractor such as Gateway FS Construction Services to build it for them. Ensuring that you select a quality post-frame contractor may seem overwhelming at first, but Gateway FS Construction Services is here to help. There are many variables to consider besides the obvious ones such as price and quality. 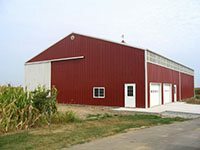 We are pleased to provide you, over the next several months, a series of articles that provide guidelines to make your decision easier to utilize Gateway FS Construction Services for your post-frame building needs. Were you pleased with the quality of the work? Did the contractor begin and end the project as scheduled? Was the building completed within budget? Did the contractor meet all the terms of your agreement? Did the contractor stay in contact with you throughout? Would you recommend this contractor and/or use them again? Gateway FS Construction Services has been constructing highly-engineered, quality, post-frame buildings in the local area for more than 50 years. Along with our more than five decades of experience, we have a multitude of references for you to question and projects for you to view. Gateway FS Construction Services, along with our partner, Walters Buildings, will meet or exceed all of your expectations with regards to constructing post-frame buildings. Whatever your post-frame building construction needs, the professional team at Gateway FS Construction Services can help. Give us a call at 866-551-3454 today and talk to one of our experienced post-frame building construction service representatives. We look forward to providing you the best customer service experience. And stay tuned next month for part 2 of our series on selecting a quality post-frame builder.